A lot of the electricity that we consume is wasted. Every major metropolis wastes a lot of energy lighting up its buildings at night, even when people aren't in the buildings. Recently Hong Kong was cited as having the worst "light pollution", and the famous skyline is really built on the massive amount of electricity that is wasted nightly. The University of Hong Kong set up a monitoring network to monitor the brightness of our skies, and is doing a roadshow to educate the public in support of Earth Hour. More than just lights, Hong Kong and other cities around the world waste energy in other ways, too. According to Hong Kong's Electrical and Mechanical Services Department, some 30% to 50% of Hong Kong's energy consumption goes to air conditioning (the figure was 44% in a 2006 survey). For some reason restaurants, movie theaters, office buildings…etc. in Hong Kong insists on blasting air conditioning all year round, even when it's not hot indoors. When you go to a restaurant and feel you need to put on more layers of clothing compared to when you were out on the street, there's something seriously wrong. A survey showed that 65% of Hong Kong schools have their air conditioning turned on when the ambient temperature is 25°C or below, and some schools have them on even when temperature is below 20°C. That just strikes me as ludicrous. Ever since the Tohoku earthquake and tsunami in 2011, there has been a wave of anti-nuclear sentiment around the world, particularly here in Asia. 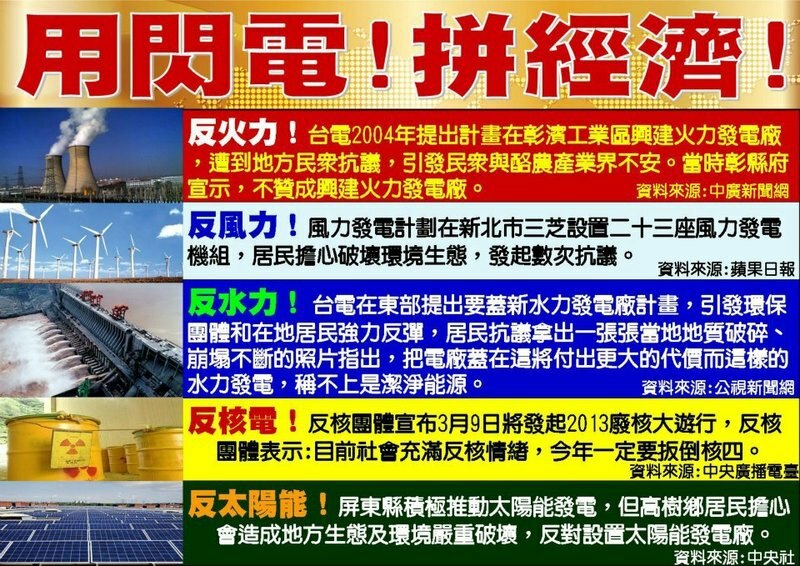 Currently there's a big debate in Taiwan about whether to proceed with the construction of the latest nuclear power plant - a project which has been delayed for years due to flip-flopping government policy. Yes, I understand that if it's not handled properly, nuclear disasters can be devastating, and pollute the environment for generations. But what are our current alternatives to produce electricity? I recently saw this picture being posted on Facebook, and just had to repost it on my profile. 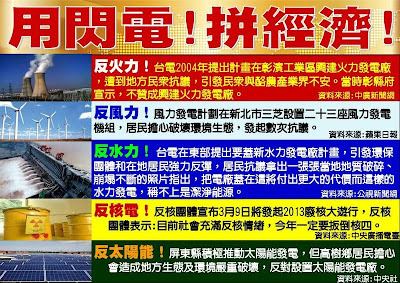 Over the last 10 years, my fellow Taiwanese have managed to protest against every form of power generation proposed by the government utility, whether it was based on fossil fuel, hydro, wind, solar or nuclear. My immediate reaction was: "WTF?! If you're gonna be against every form of electricity generation, what are you gonna do to generate the power you consume? Are you gonna use "human power" and generate it by riding a stationary bicycle?!" The best solution to helping our environment and reduce our carbon footprint, of course, is to reduce our energy consumption. THAT is the true message behind Earth Hour. So… back to tonight. I parked myself by the waterfront near Star Ferry in Tsim Sha Tsui, and waited as the lights started going out just before 8:30 p.m. I was heartened to hear an announcement along the waterfront that the nightly Symphony of Lights - a silly laser and light show - was cancelled tonight because of Earth Hour. As 8:30 p.m. hit, MOST of the buildings in my field of vision went dark. Well, kinda… Most of the external lights, LEDs and neon advertising were turned off, and while the harbor didn't go completely dark, it was a damned sight better than what it looked like just minutes ago. As I scanned around the harbor towards the Hong Kong side, I could see that the only building remaining stubbornly lit was the Agricultural Bank of China. It never occurred to anyone there to do anything for Earth Hour, and for that they stood out among their neighbors. After a delay of 15 minutes, the red Toshiba neon sign finally went out, and a few minutes later a neighboring LED sign (appropriately advertising an LED company) went dark. The Garden and WeChat signs near Victoria Park never budged, and remained lit all evening. A few of the neon lights started coming back on around 9:15 p.m., and by 9:35 p.m. we were pretty much back to normal. It took me a couple of minutes to get used to the lights again, and the big LED sign from Samsung directly across from me seemed particularly blinding. I'd put it as one of the biggest contributors to light pollution here. I'm so happy to see the increased level of participation around Hong Kong, raising awareness among the general public. My office building was a participant, and hell, even the apartment building I'm staying in - which is in the boonies - posted notices about the extent of their participation in Earth Hour. If buildings so far away from Victoria Harbour are doing it, there is hope after all!